I got an email from one of my reader and He is asking me that where is SAC in SQL Server 2008. Microsoft has removed the Surface Area Configuration tool that was shipped in SQL Server 2005. The Services and Connections which were previously managed using Surface Area Configuration tool is now managed using the SQL Server Configuration Manager. To manage the database engine features you have to use Policy Based Management. For that you have to use Surface Area Configuration facet. 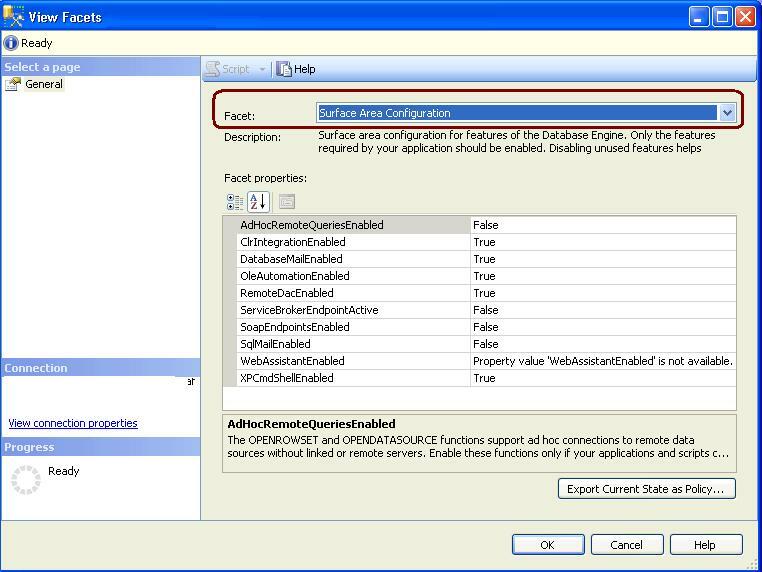 You can follow below steps to configure the Database Engine features. This entry was posted in SQL Server 2008, SQL Server 2008 R2 and tagged Policy Based Management, Surface Area Configuration on February 18, 2011 by Jugal Shah.